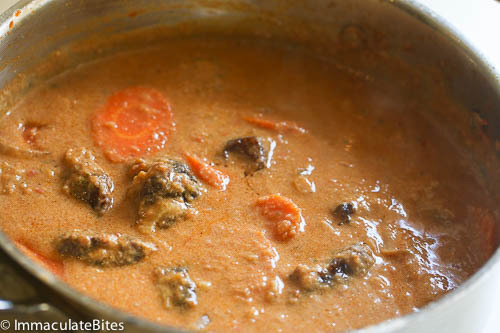 Maafe –aka groundnut soup, to most West Africans, an all time- time favorite African soup, a dish that is beginning to earn it’s way in the upper echelons of the soup universe. Oh yes! Don’t tell me you haven’t tried it, cause you have been missing out! Looks like Curry right? But it’s not! 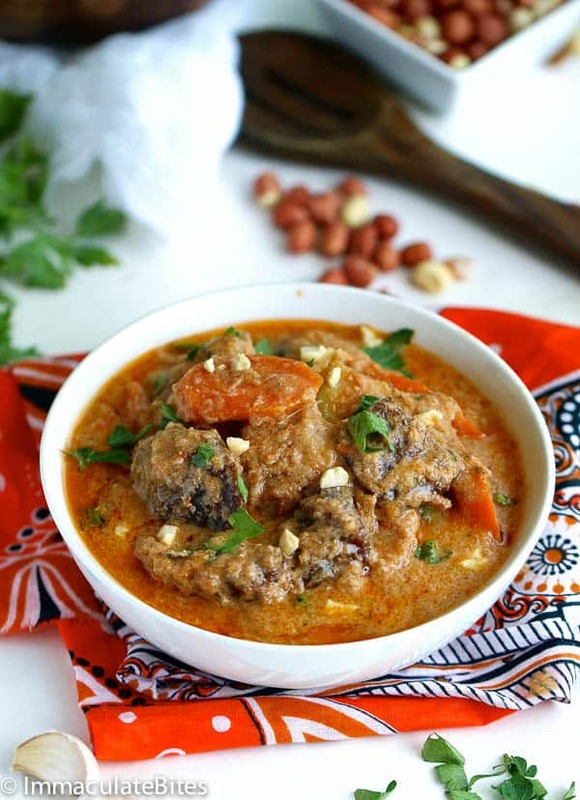 Care for another groundnut soup? 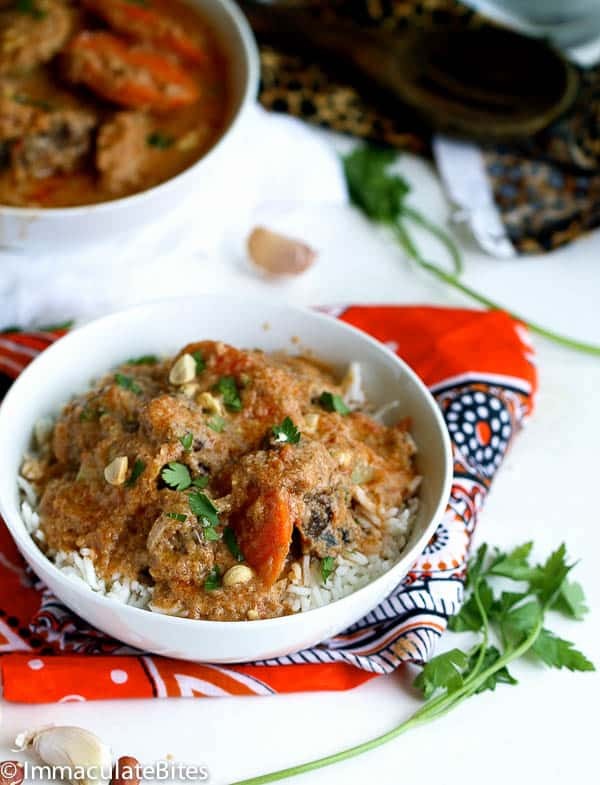 Unlike the chicken version this here this creation is inspired by the traditional version mostly enjoyed in many Senegalese house holds, It begins with boiling the meat, then browning, followed by a blend of tomatoes, onions and any other spices. What sets this one apart is the addition of sweet potatoes and carrots. Making it a one pot meal or not, and it. If you choose to go that route. I must say I love the added sweetness from the potatoes and carrots . You can completely make this vegan too! if desire, just omit the protein and increase the spices. 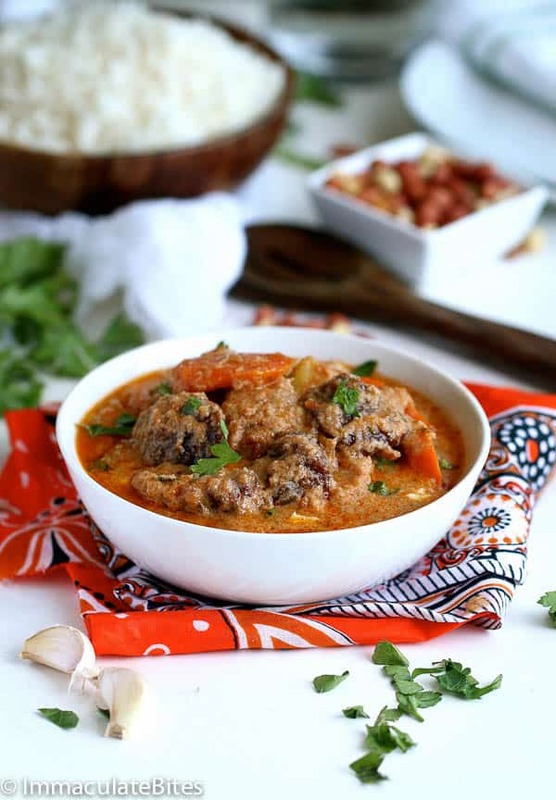 This stew is rich with flavor and very tempting with tempting combination of flavors – garlic, ginger, herbs and of course a little bit of spice. 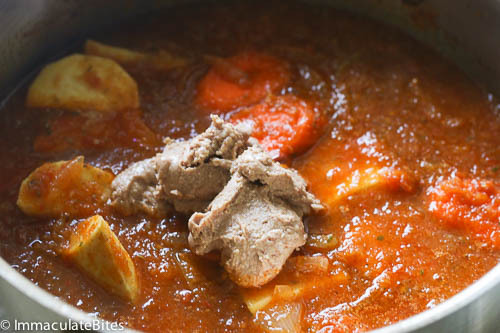 As with most stews or soups this is open to so many variations based on your preferences, availability of ingredients and time. You can never go wrong with this soup. If there are any vegans out there, you can completely make this vegan with good results. When my nephew was a toddler we sure had our challenges trying to get him to eat anything other than carbohydrates, this one sure did the trick, he fell head over heals with this, especially served with rice. Here I used freshly ground peanuts, always have them handy or just use peanut butter paste. 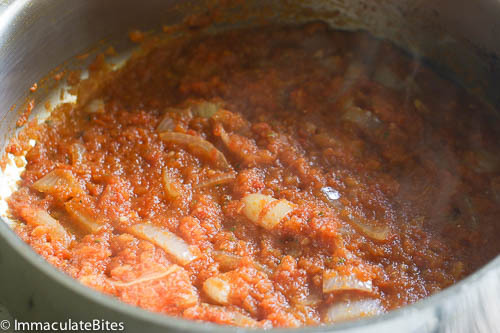 Blend tomatoes, and 1/2 onion, garlic, and parsley. Add half of the onions to the pan , sauce for about a minute and pour the mixture in the saucepan; add paprika, white pepper and sauté for about 7-10minutes. Stirring frequently to prevent burns, add stock as needed. 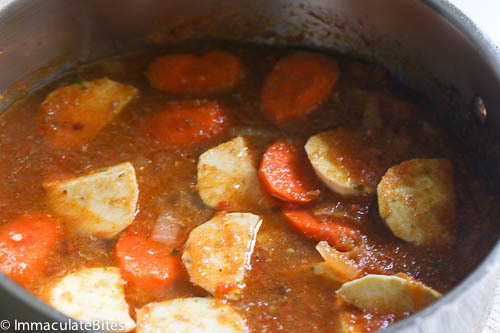 Then add potatoes, Carrots, peanut butter paste, scotch bonnet pepper and about 3 cups broth. Continue cooking until potatoes tender- about 10 or more depending on vegetables. Throw in the browned beef, Adjust the soup thickness with water if necessary. You may skip the beef or chicken browning, if you do not want to deal with any frying or browning and proceed with the rest of the instructions. If you are cooking for kids, skip the cayenne pepper and leave the scotch bonnet pepper whole, if not prick to add some heat but not too much. Hi there! I haven’t tried your recipe yet but I grew up eating Maafe and Poulet Yassa! The recipes were shared verbally with my mother by two different African women in Guinea. My parents were missionaries in Guinea West Africa for 9 years! I was so surprised to fined your recipes! I am making yassa tonight…but we use limes! I have never added the Dijon so I am excited to try that addition. I will be checking back for more fun recipes from my childhood home! I used bone in chicken breast instead of beef. I used a mix of organic peanut butter paste and Jif. Then I added parsley and lime juice at the end. Very delicious. Next time I’m going to add a few smoked turkey wing pieces. Glad it turned out great for you, Megan! Thanks for dropping by. I am excited to cook this for Easter! You are going to love it! Happy Easter!!! This looks delicious. I have two questions. Does this work if you make it with lamb meat? And, would it ruin the dish to tenderize the meat in milk first? I think it would do just fine, even after you tenderize the meat. 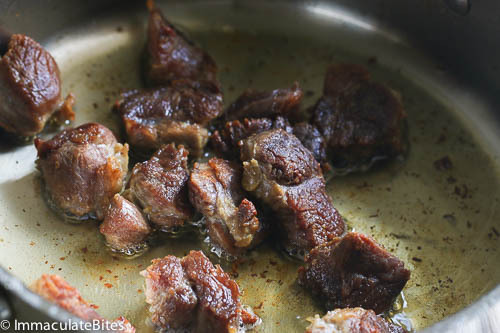 Have made this with goat meat before and everything worked just fine. Do let me know how it works for you. Thanks . This was so delicious!! 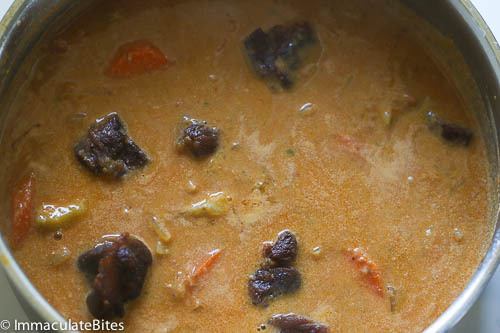 I made this after making + loving your African Beef Stew. This was filled with so much flavor and a kick from the habanero pepper. Like you mentioned, I loved the sweetness the carrots + sweet potatoes added. I simmered this for about 1.5 hours until my beef was tender, so some of the potato had dissolved into the stew making it more creamy and thick. It was the perfect balance of spicy, sweet + creamy. Damn, so so good. I’m looking forward to trying out your other recipes! Thank you!! I just found your site. My husband is Senegalese and I’m from a background of West Indian, Louisianan Creoles. So when I stumbled upon this site, I was like wow, wow, wow! 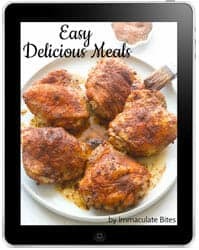 My dear, these recipes are so on point! Husband makes maafe all the time, I practicall craved it when I was pregnant and I can’t wait to try your Jambalaya! Many thanks and God’s blessings, BTW. My daughter’s name is Immaculate! Thank you Sis! Really makes me happy that you would take the time to share your thoughts . Can’t wait to hear how your the jambalaya turns out !!! Say hi to your daughter for me. Tell her it’s coming from another Immaculate. This dish looks incredible! Sorting my grocery list now, would you use boneless chicken in this dish or it is better with the bone for flavor and moistness? 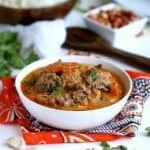 Thank you for such an amazing blog and educating us on Afro-Caribbean cooking! My pleasure Sandra! Glad to hear it worked out well for you. The combination of ingredients sound delicious. Your photographs are beautifully done and they make all of your recipes look appetizing. I want to try this recipe! What cut of beef do you recommend that I use? Sirloin would be the best cut to start with. However, any other cut would work just fine. You might just have to cook it a little more until it’s tender. Would the taste really be compromised if I substitute the chicken broth for vegetable broth? Can you use regular peanut butter as well? Wow, this looks amazing! Really enjoying your blog. It’s awesome. Thanks Steve , glad you enjoy it! mmmm would love me a big bowl of this! Amazing stuff! Wow what a hearty soup, love the flavor of peanut. Delicious! Oh wow!! The flavors sound perfect together..I am sure most Indians would love it! Peanuts add such a wonderful flavor to things. I am definitely going to make this. Pinning!! This dish reminds me a dish calls African chicken that is a local cuisine in Macau. Now I can see where the influence came from. Love the flavor combo of tomato and peanut, a nice and special savory flavor that is so comforting. Pinned and shared! This is the perfect hearty meal for the weather right now. Never tried a peanut based stew or soup so I am inspired here to make the recipe. And another delicious looking dish! I so want to try this! Aww Thanks Mark. This would a great dish to try. The deep rich color of the sauce and my love for peanuts makes me want to reach in and taste it right now! Definitely making this! Oh! Yummy! This is one of my favorite soup and you make it look so good! I just discovered your website and I’m sure glad I did!! I’m going to start with plantain pancakes and work my way through trying your recipes. Thanks! Welcome Maureen! Glad to have you here.Do let me know which ones you try out! This looks like a hearty soup or stew! It sounds incredible too! This one needs to hit the list of “Must trys”. What incredible flavors going on in this dish! I just tried this now and it was très délicieux!!! Thank you for another great recipe! Oh boy. That sauce looks incredible. Absolutely incredible! The colour is so rich and deep, I just know it is packed full of serious flavour! Pinning! It sure is Nagi, thanks for pinning.